Joanne Reay is a British scriptwriter and producer. Her debut novel, Romeo Spikes, is the first part of the Lo’Life series, and is available now from Titan Books. Thanks for taking the time to speak to us, Joanne. I’d like to start by looking at the origins of Lo’World in general and, in particular, the story that plays out in Romeo Spikes. What was your starting point, and how close to your original vision did the story end up staying? Lo’Life began as a screenplay, telling the story of Lola. Then, by chance, the script was passed to a publisher who asked if I’d adapt it as a novel. I jumped at the chance because it gave me the opportunity to build the entire world around Lola and explore not only her origins, but also the entire shadow community that lives amongst us. The world in which the novel is set seems to be a slightly skewed version of our own reality. Beneath all this, you have Lo’World itself. Did you make a conscious decision to create your own world as part of the writing, or are the changes merely born of necessity? The thrill of writing a supernatural story is to be unbound by the flimsy four dimensions of our reality. Hell, who wouldn’t love world-building? I can see why God gets a kick from it. The novel comes with a lot of backstory. You have managed to seamlessly weave ancient mythologies and legends, religious and philosophical histories with your own fictional origin stories. The amount of research required to even skim the surface of many of these areas seems, to me, phenomenal. How much research did you do to get the story right, and how did you go about it? Whenever I set about to find a specific fact, I always allowed myself the time to click on odd links that caught my eye, or follow a foot-note that would seem unrelated but somehow intriguing. I’m a great believer in floating on the thermals of random data. The most fascinating plot points I found came from rudderless mental drifting. And following on from that, did you find any nuggets during your research that you loved, but that you just couldn’t fit into the story? I have barely scratched the surface of Tristmegistmus, so his secrets will be further disgorged in the coming books. How far into Lo’Life’s future have you planned? Is there a definite endpoint to what you have started, or can you only see so far into the characters’ futures? There are two further stories planned and the narrative could easily stretch far beyond that. In the next book, Black Antlers, Detective Bianco is taken deep into the supernatural world of Lola. In the next book, the roles are reversed and Lola becomes locked into the search for a bizarre and brutal serial killer. As the two worlds of humans and Tormenta once again collide, the investigation takes an unexpected twist into the realm of quantum theory. What authors or works have influenced you as a writer? Lewis Carroll was a revelation and as a child, he taught me a new freedom with words and meaning. And as a follow-on, is there one book (or more than one) that you wish you had written? The Information by Martin Amis. What does a typical (writing) day in the life of Joanne Reay look like? It begins with a walk to my local coffee-shop and on the way, I plan the next chapter and wrangle with dialogue ideas. Then I write for three hours, sometimes more, before heading home. Switch on the TV (as I work better with background noise) and read through what I wrote that morning and make amendments. At 6pm (latest) it is time for Gin&Tonic. Then after dinner I’ll probably drift back to my laptop, having had some great inspiration in the bath. And what advice would you have for people hoping to pursue fiction-writing as a career? I believe that everyone should find some creative expression, but if you want to make writing a paying career, then you have to be ruthless in terms of getting objective feed-back on your work. Friends and family might tell you it’s great, but you need to hear the truth from those who are able to speak freely. And when you get comments, don’t just hear what you want to hear. Embrace the negatives and work at improving. What are you reading now, and is it for business or pleasure? I’m reading “Free Radicals” by Michael Brooks. It’s giving me some invaluable insight into the scientific community that surrounds quantum theory. Would you like to see the Lo’Life novels make the jump from page to screen? If so, do you have any dream casts/directors/whatever? I’m already working on the screenplay, which has moved on since the original. My ideal actor for Dali is Tom Waits and for Bianco, Zoe Saldana. If you could meet any writer (dead or alive) over the beverage of your choice for a chat, who would it be, and what would you talk about (and which beverage might be best suited)? I’m related to John Bunyan and he was a radical dude. Pilgrim’s Progress was the most published book of its time, second only to the Bible and it delivered a world-shaking message. Bunyan was so popular that the King (who had him imprisoned for his dangerous views) was forced to release him. He told Bunyan that he was free to go, as long as he ceased to preach. Bunyan walked out of Bedford jail, took eleven paces began preaching at the top of his voice. He was promptly thrown back inside. I ‘d love to talk to him and find out what gives someone the courage to stand up for their beliefs. Not sure what the beverage would be – kinda limited in those days, so maybe some manner of undrinkable beer. Thank you once again, Joanne, for taking time out to share your thoughts. 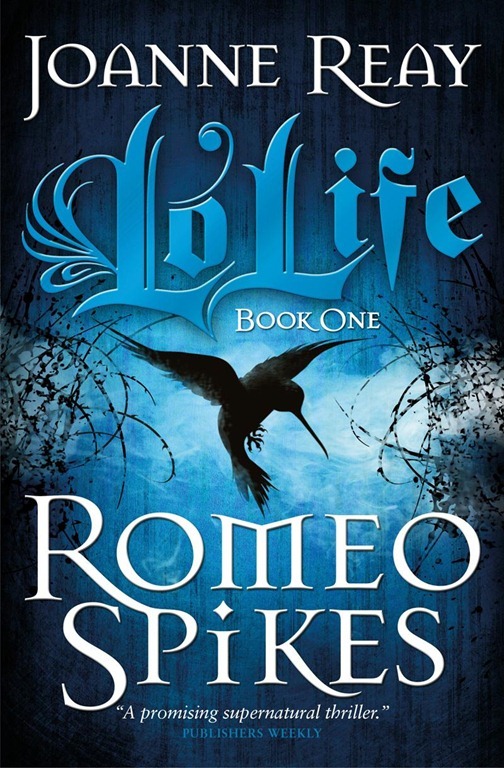 ROMEO SPIKES, the first of the Lo’Life novels is out now from Titan Books. Working the Homicide squad, Alexis Bianco believes she’s seen every way a life can be taken. Then she meets the mysterious Lola and finds out she’s wrong. More weapon than woman, Lola pursues a predator with a method of murder like no other. If you think you’ve never encountered Tormenta, think again. You’re friends with one. Have worked for one. Maybe even fallen in love with one. They walk amongst us—looking like us, talking like us. Coercing our subconscious with their actions. Like the long-legged beauty that seduces the goofy geek only to break his heart, causing him to break his own neck in a noose. Or the rockstar, whose every song celebrates self-harm, inspiring his devoted fans to press knives to their own throats. The pusher who urges the addict toward one more hit, bringing him a high from which he’ll never come down. The tyrannical boss, crushing an assistant’s spirit until a bridge jump brings her low. We call it a suicide. Tormenta call it a score, their demonic powers allowing them to siphon off the unspent lifespan of those who harm themselves. To Bianco, being a cop is about right and wrong. Working with Lola is about this world and the next…and maybe the one after that. Because everything is about to change. The coming of a mighty Tormenta is prophesied, a dark messiah known as the Mosca. To stop him, Bianco and Lola must fight their way through a cryptic web of secret societies and powerful legends to crack an ancient code that holds the only answer to the Mosca’s defeat. If this miscreant rises before they can unmask him, darkness will reign, and mankind will fall in a storm of suicides. Nobody’s safe. Everyone’s a threat.